As some of you might know (or read about it), me and wifey was in Kota Kinabalu for a short weekend of dirty sweaty fun (that is the Borneo International Marathon). As the lodging was planned rather last minute and we did not want to spend too much money on a hotel room that we most likely will only use to sleep for 3 hours (or 4), the thoughts of staying in a backpacker's hostel did come to mind. However, many of us here would had at one point of time, bad experiences with a backpacking hostel. Take the image below as an example (NOTE: THE IMAGE IS NOT Borneo Backpackers). I believe the image above is enough to turn anyone off. So, with a lot of caution and a lot of research and feedback from previous people that stayed in Borneo Backpackers, myself and wifey decided to give the place a try. Tey's honest feedback most probably influenced the decision. We all know Tey to be a straight firing honest chap and his words are often what it is. I started by going to their website BorneoBackpackers.com and checking their rates. At a glance, if you travel alone the rate is very attractive as RM20 will get you a bed with basic facilities. However, the most important aspect is not the price (which comes secondary) but the cleanliness of the place. 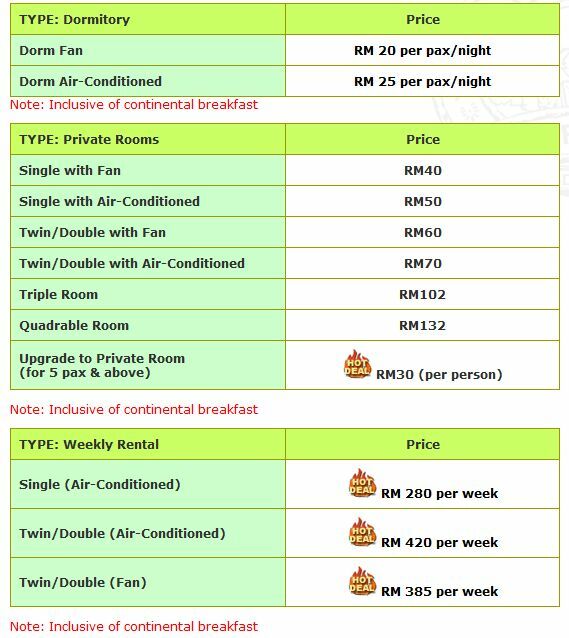 For privacy and to get a bit more rest, we decided to pay a bit more and get the twin/double with aircond room at RM70. Even if we were to pay for the individual RM25/night in the dorm style room, it is RM10 extra each for a little bit more privacy, which is perfectly fine. Double bed for the newly wed.
To say the least, we were not dissapointed. From the photo above, the sheet was fresh and clean with no stains. The room does not smell mushy and there is a small window for ventilation. It is fitted with an aircond and the space, though a bit tight (due to the platform that was the airwell), was sufficient for two person to move around comfortably. The room we got was on the top floor and most of the activities take place on the first floor where the reception office were. The place is secured with a magnetic security door that is password protected (given when you check in) and the single most wonderful thing is the free wifi! No one can resist that. Some hotels even fail in this department. If you wondered how your photos taken by Tey got uploaded so fast while he is in Sabah. Here is him working OT for you chaps! Thank you Tey! The place is well fitted with enough human comfort to ensure a good rest after a day of walking (or in our case, running). With 6 bathroom and 6 toilets (8 on first floor and 4 on second floor, equally distributed) with water heater, it provides adequate bathing/shower/washing facilities. However, the pressure is a bit low and do expect to take a slightly longer bath/shower to wash off the soap. There were two water pump on the top floor balcony (aptly name the Roof Garden) but perhaps due to old piping or old pump, the water pressure ain't too great at the shower head. The backpackers' lodge provides basic ironing facilities (assuming you are a business traveller on budget) and even free computer/pc usage with internet, should you not have one or have a smart phone with roaming facilities. It is true about what they say when it comes to Backpackers's lodge. The cleanliness is dependant on the people that stays there. One thing i noted about Borneo Backpackers is that the caretaker, Edith and Leena knows each occupants by name. Perhaps, this is one way for them to observe potential backpackers that are destructive, dirty or uncoperative in nature. Afterall, these facilities are meant for common usage and if one were to dirty the toilet, the next person would not be able to use it comfortably. So, a big hand for those that stay in Borneo for helping to keep the place clean! A table for anyone wishing to work or need a table..duh. The lodge provides washing lines on the first floor and the roof top where backpackers can opt to do some light washing (there is also a washing machine at the roof, but do check if you can use them, could be for linens or usage by the admins) and get your items dried before re-packing. Denomination left by otehr travellers. Nice touch. could possibly spot some hard to find currency too! Hospitality at the place is good with the lodge providing simple breakfast (included in the lodging fees) consist of bread which you can toast, with jam, butter (yes, butter, not margarine) and kaya (coconut jam). If you want something else, you will have to pay for it, such as Instant noodles are sold at RM2 (reasonable) and they have other drinks for sale too. However, as you are already in the heart of Kota Kinabalu ( known as Mile 0, yes mile Z-E-R-O), food are in abundance and it is as near as RIGHT below the Borneo Backpackers if you do not wish to walk far. Borneo Backpackers is situated in Jalan Dewan, next to the (old) Polis headquarter. It is a street from Jalan Gaya - the busiest street where you will find food and all sort of local businesses. It is 2 streets away from the shopping malls scattered along the main road and three streets from the seaside where all the markets are. The location is simply superb and do bear in mind that there are others Backpacker's lodge along Jalan Dewan or Lorong Dewan (behind Borneo Backpackers) that could offer similiar if not better condition or services. My buddy Kam Kasturie stayed in Bunidon Lodge and he confirmed that they are clean too. If you happen to stay in Borneo Backpackers or along some of the backpacker's lodge in Jalan/Lorong Dewan, don't forget to visit the weekend (Sunday only) Gaya Street Market. It will be a good experience to see how the locals are out in forces (as opposed to the more commercialised and expensive Philipino Market) to ply their trades. More people are seen here than anywhere else in Kota Kinabalu on Sunday morning between 6am to 12noon! Reminds me of Jalan Pasar in KL. Even money (old ones) are sold, for a premium. Too expensive to eat. These are "show chickens"
All in one, even vegetable sold at Gaya Market. So, if you are in Kota Kinabalu and need a simple place to stay for a night or two, head over to Borneo Backpackers for a reasonable cheap lodging. The caretakers are friendly and even if you are checked out, you can still hang around the place while waiting for your flight. They can help arrange for transport in KK to Airport or to anywhere for a reasonable fees (paid to driver directly, they do not take commission). This place will be my choice of stay the next time i am in Kota Kinabalu. Afterall, if the place is clean, it is a win! stupe, did you stay at the first room. The window actually opens to the staircase and not to the outside. I stayed at the exact room before after my Mount KK climb.